They say ‘The Devil’s in the details’. That doesn’t mean that it should be more work. I used to always bake cakes completely from scratch. That is, until I realized the number of steps I could skip… if I used a prepared cake mix and added the extras. Baking is a very precise process. The ingredients MUST be measured out exactly or the end result could be disastrous. That is because baking relies on the chemical interactions of the various ingredients in order to work. Just a pinch too much of baking powder will make your cake as dense as a rock. For that reason, using prepared mixes are ideal for those that don’t bake often. Simply follow the instructions on the box and add nuts, chocolate chips, coconut or other flavors to enhance the basic nature of the cake. 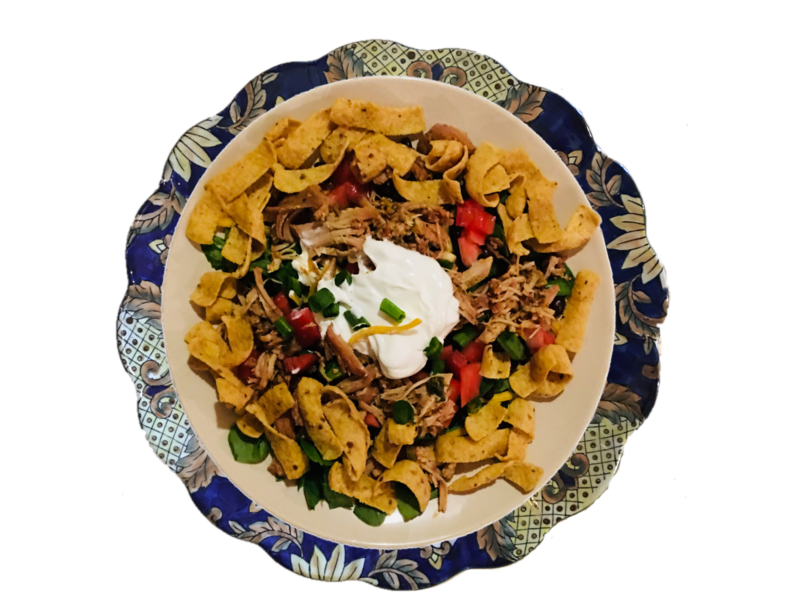 This amazing Mexican Pork Salad has long been one of our family’s mainstay dishes. A few years ago, we were sitting down to dinner and our youngest daughter Avril insisted that I needed to write a cookbook so she would have all of my recipes when she was older. Immediately, the other two kids were encouraging me to write a cookbook as well. I don’t know what other families are like when comes to the kids getting an idea in there head, but mine refused to give up on the subject. I think what really got my attention was when our eldest daughter, Onyx, mentioned the idea again and reminded me that I already make a living from writing….so why not create a new brand for the company. Thus with vast amounts of encouragement, Simply Ardynn was born. Like many projects and ideas Simply Ardynn seemed to evolve and grow with a mind of its own. From the initial thought of a traditional cookbook to a subscription based vlog to what is now a fully interactive cooking app. With such a long history in publishing, I knew that many people no longer bought physical books and each time I searched iBooks, Amazon or the App Store (in order to do my competitor analysis) I saw a new type of product being released. This started to worry me, until I realized that no only is there always room for competition, but that having multiple revenue lines, product extensions and user options available would set us apart from the pack. The core belief behind Simply Ardynn is that no matter how busy you are as a professional or how limitied your knowledge is in the kitchen, you can create amazing food experiences that bring family and friends together. All the while creating memories that will last beyond your lifetime, but trickle down through your kids and grandkids. Below, you will notice the ingredient list for our Mexican Pork Salad Recipe. Being that it was the reason for this new venture, it seemed appropriate that it be the first recipe I shared as we start that pre-promotional aspects our the Simply Ardynn launch. Currently, we are set to launch on Ardynn Media Groups 10th Anniversary, February 11th, 2018. So stay tuned as we embark on this exciting journey. The closer we get to launch date, the more events will be scheduled and a few contest giveaways even are planned. I hope you will stay tuned and follow us as we head into a new part of our lives.